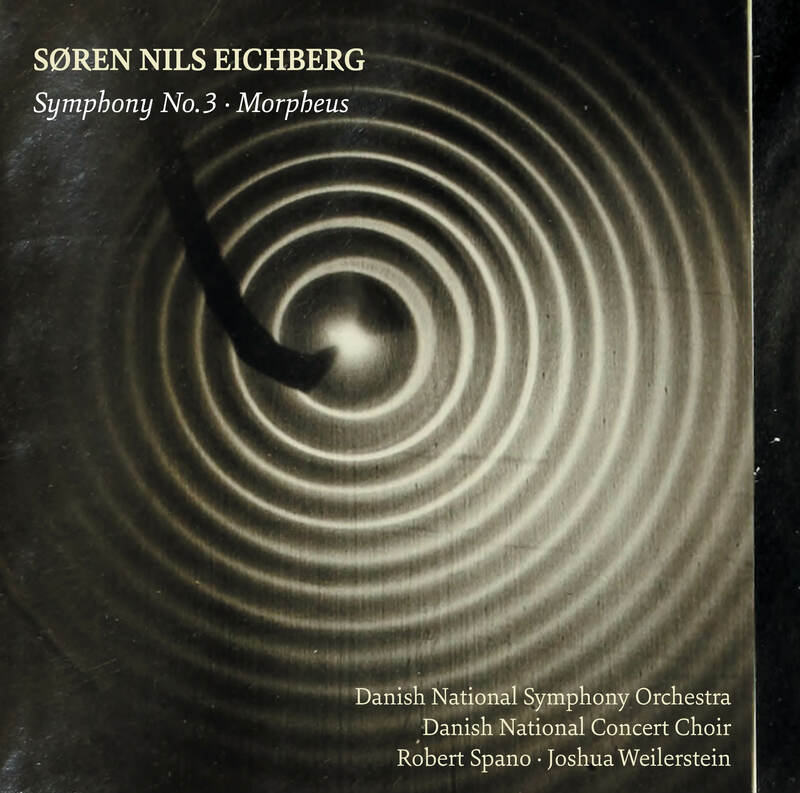 This CD marks the conclusion of Søren Nils Eichberg’s residency with the Danish National Symphony Orchestra – a fruitful cooperation that has resulted in a handful of large-scale works, born of Eichberg’s keen exploration of the orchestra. In place of the thematic formality of its predecessor, Symphony No. 3 looks far out, asking looming existential questions to which there aren’t always clear answers. As a counterweight, the even more symphonic ‘concerto for orchestra’ Morpheus revels in color and effect, bringing a sense of joy and discovery to the music. Zurückgehalten, genau 5:10 9,60 kr. Solen er så rød – Wiegenlied 1:35 6,40 kr. Pa’am – Sehr langsam 7:09 9,60 kr. Ruhig aber genau 2:38 6,40 kr. Wer kann es sagen – Unwirklich 3:52 6,40 kr. Sedna – Bewegt 5:04 9,60 kr. I. Vortex – Entschieden 4:53 6,40 kr. II. Trees and Walls – Einsam 5:06 9,60 kr. III. Escher (Toccata) 3:12 6,40 kr. IV. Crystal – Zurückgehalten 2:52 6,40 kr. V. Into the Cloud – Breit 4:41 6,40 kr. VI. Non-Euclid – Nervös 2:30 6,40 kr. VII. Arctica – Mit grösster Energie (applause) 4:11 6,40 kr. After the keen psychological insight and adroit exploration of electronics that characterized his opera for Covent Garden, Glare (2014), Søren Nils Eichberg started work on his Symphony No 3. Like its predecessor, the symphony was born of Eichberg’s residence at the Danish National Symphony Orchestra in Copenhagen. But the structural thinking – perhaps even the entire formal approach – marks a departure from those works. In place of the Haydn-like thematic ­formality and growth of the earlier symphonies, the Third looks far out from the start. It asks ­bigger questions to which there aren’t always clear, resolving answers. Eichberg refers to this freer approach to symphonic design as a ‘psychological form’, music that operates on dramatic impetus rather than architectonics – organization without the overt reliance on directly interwoven thematic material we have heard from him and plenty of others before. This willingness to look at his craft anew, to question and even discard previous working methods, is seen by the composer as central to his responsibilities as an artist. ‘Questioning what you have done up to any given point is what makes art’, he says. Questions, big and small, characterize the Third Symphony scored for orchestra, choir and electronics. Eichberg describes it as his ‘most personal piece to date’, referring both to its recoiling from the extrovert expression of its predecessors but also to the handful of tangible external influences that make their way into the piece: sounds recorded by NASA’s probe Voyager as it made its way into space; excerpts from Qu Yuan’s poem The Heavenly Questions dating from circa 300 BC; Carl Nielsen’s lullaby Solen er så rød, mor (Look! the sun is red, mum); and the inclusion of the Hebrew poem Al sfat hakrach esheva by David Vogel. These, and the series of spinning algorithms that often underpin the symphony’s progress, appear to underline the music’s search for something to which it can cleave. But if any certainties are discovered, they are soon belittled by the vastness of what goes on around them. Like any of life’s irrefutable, unquestionable certainties, they prove insufficient, irrelevant even. Perhaps those fleeting footholds are glimpsed in the spectral chord that recurs in different shapes throughout the symphony – in the snippet of the lullaby, or in some of the recurring thematic shapes that float in and out of the ether like those that crank-up the score’s opening paragraphs. The latter are soon interrupted by the first appearance of choral voices, posing Qu Yuan’s double question ‘Wer schuf Licht und Tag aus Dunkelheit und Nacht?’ and ‘Wer grub die Täler tief, wer trägt die Berge hoch?’ (‘Who created light and day from darkness and night / Who made rills and valleys so deep, who carries the mountains so high?’). After the naivety of Nielsen’s lullaby, the questions appear more and more emphatic and overwhelming, countered only by even greater vastness or introspective detail. Woven into the latter phenomena is the patterning that established itself as a signature device in Eichberg’s earlier symphonies. Here, the patterns are algorithmic, renewing and quoting themselves in a process of self-similar evolution that echoes the cosmos into which NASA’s space sounds also echo. Sometimes Eichberg’s patterns fall into a slow, upward glissando; sometimes, fuelled by momentum, they power forward towards another answerless void. From one of those voids, or perhaps from the wreckage of the lullaby that emerges from it first, a different text appears: the poem Al sfat hakrach esheva originally set by Eichberg at the behest of his Tanglewood Fellowship colleague Avner Dorman. Eichberg states that he “had a strong feeling that my earlier Tanglewood thoughts on the Hebrew poem by Vogel related to and augmented what I was trying to say in the symphony”. The beautiful hesitance of the poem – ‘At the edge of the city I sit / sit tiredly’ – is initially reflected in the music. But the sentiments are pushed by underlying rhythms into blossoming outwards in defiance, reaching an expressionistic apex before retreating into themselves once more. From that gesture, one of Eichberg’s most lucid cyclic patterns emerges, a sort of cosmic ostinato cast for the horological combination of flute, oboe, clarinet, woodblock, glockenspiel, triangle, vibraphone and secretive low brass and strings. Perhaps the delicate machinery of this passage foreshadows the pounding momentum spawned later on that charges towards a radiant choral emancipation in A major. The orchestra is drawn joyously in, and it can feel like a tangible, even emphatic conclusion. But in its wake, isolated parts of the orchestra are left to mutter and muse spatially, as if a universe of questions remains. ‘It may sound very naïve just to ask these big questions’, says Eichberg. ‘But that’s the privilege of art – to simply ask’. Anyone familiar with Eichberg’s first two symphonies might feel the Concerto for Orchestra Morpheus has more in common with those pieces than with the contemporaneous Third Symphony. Morpheus sees Eichberg’s interweaving of clear thematic shapes, themselves organized in distinct and often symmetrical musical paragraphs, foregrounded once more. ‘Chains of associations appear to logically lead us from one line of thought to another’ says the composer. But for all that clarity, we are reminded by the title itself – Morpheus was the Greek god of dreams – that the logic contained within may operate according to its own treacherous or untrustworthy rules. A sort of smiling Totentanz, Morpheus is arranged into seven short sections that see the composer exploring a chosen motivic idea from multiple angles – often excitably, always piercingly – before closing the door and moving on. As in a dream, we’re never quite sure if the motif in question has been heard before or not; the familiar and the unfamiliar merge in music that can feel intangible yet clearly present. For all the theorizing, Morpheus could just as well be described as an act of decadence from Eichberg – a last chance to explore the virtuosity and sonority of the Danish National Symphony Orchestra by working-up a ‘concerto for orchestra’ in the tradition of those by Bartók and Lutoslawski, reveling in colour and effect. If anything, the sense of unity in Morpheus’s tight motivic gameplay makes it even more symphonic than the Third Symphony that followed next, while the chance to hammer his motifs into so many shapes and sizes brings the music a sense of joy and discovery that might just prove the perfect counterweight to the looming existential questions of the Symphony No 3. Death is death, but life is life, too; enjoy it while you can. "The 3rd Symphony is dedicated to my father. It was composed in 2014 and 2015 while it became clear that his illness would be terminal. He passed away in early 2017. – Sounds recorded by NASA’s “Voyager” probe on its way into space. – The Shepard tone: an auditory illusion of a tone that continues to rise yet never changes. – Algorithms which repeat themselves and yet are never the same. – Excerpts from Qu Yuan’s Chinese poem “The Heavenly Questions” from around 300 b.c. with 170 questions and not one single answer. – A Hebrew poem about the loss of childhood. – A Danish lullaby “Look! the sun is red, mum” but only in instrumental form, never sung and only in variations – only as a memory. Towards the end the chorus sings without text, and at the very end even with closed mouth, while the tonality rises and rises. And we realize, that a fixed and certain Archimedean point may not exist. But the searching and the asking and the questioning might be answer in itself."